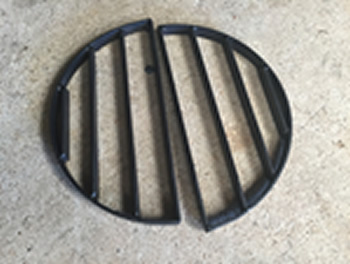 WE NOW OFFER THESE CHIMINEA GRATES IN 100% STAINLESS STEEL! We custom make chiminea fire wood grates. If you had a grate for your chiminea and it rusted away we sell replacements. Our grates are very heavy duty for the purpose. We use 1" solid steel turned on it's side for the grate material. Choose the size you need but remember the grate needs to fit thru the opening of the chiminea. If the grate is larger then the opening then order the size you need but order it in two pieces. This will insure the grate fitting thru the opening. Anything over 15" we only sell it in 2 pieces.